﻿﻿﻿﻿﻿﻿ *Thanks to all who applied! Our team is now set, but we will reopen registration at a later date. 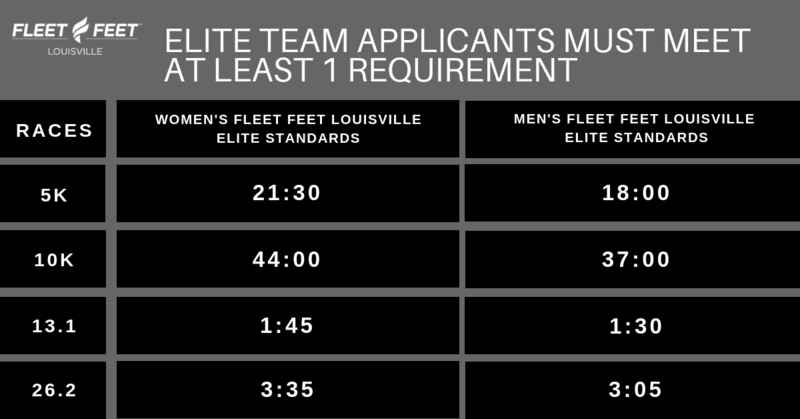 NEW BALANCE SPONSORS THE FLEET FEET LOUISVILLE ELITE TEAM. OUR GOAL IS TO ENHANCE PERFORMANCE BY ENABLING YOU TO BE AS COMFORTABLE AS POSSIBLE WHILE RACING. IN ADDITION, WE WANT YOU TO LOOK YOUR BEST AS A TEAM. IN THAT SPIRIT, EVERY TEAM MEMBER IS REQUIRED TO WEAR THE CHOSEN NEW BALANCE RACE KIT, SHOES, AND AND OTHER ACCESSORIES. GET READY FOR AN EXCITING SEASON OF PERFORMING AND LOOKING YOUR BEST! Tell us why you want to be on the Fleet Feet Sports Racing Team. Are you active on social media forums? Please tell us which ones. What volunteer work (if any) are you involved in? What is your most competitive/favorite distance to race? What are you personal records in the last two years at the following distances: 1-mile, 5K, 10K, Half Marathon, Full Marathon, Any Ultra Distance (please specify)? What are your current favorite: running shoes, running top, running shorts, or any other favorite accessories?